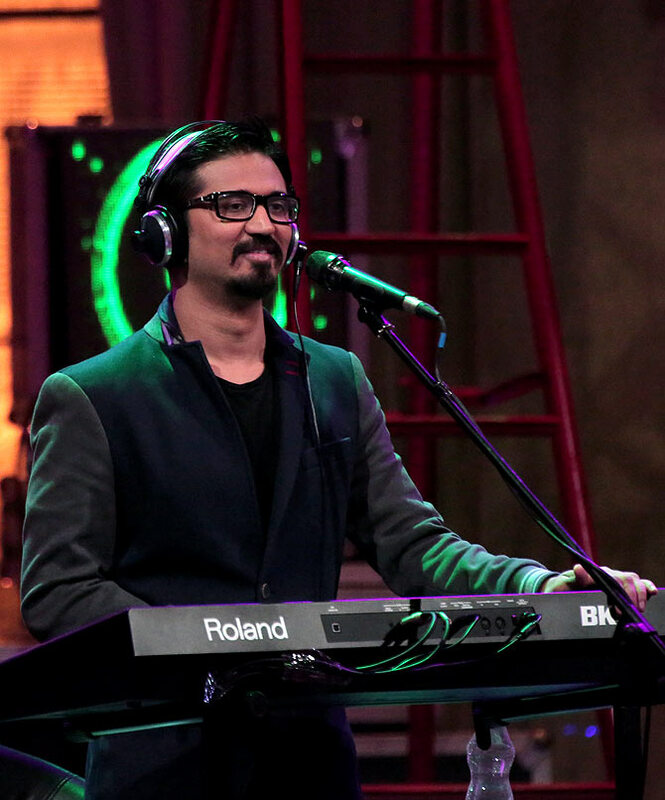 Meet Amit Trivedi, Bollywood's hottest composer! Amit Trivedi is visibly ill at ease. The maverick composer fidgets a lot as he sits surrounded by journalists in the cafeteria of Reliance Studios in the north-western Mumbai suburb of Goregaon. He is recording his episode for the third season of Coke Studio @MTV, is on a tight schedule, and clearly sees this media interaction -- scheduled when the crew breaks for lunch -- as precious time being wasted. The force behind explosively angst-ridden songs in Anurag Kashyap's Dev D answers each question in a zen voice as pens move furiously and voice recorders inch closer to his mouth with each statement. Trivedi and his band have just wrapped up one of the songs for the episode. Khari Khari, sung by Kavita Seth and Rajasthani folk singer Kutle Khan, features a melodious guitar solo by Warren Mendonca of Blackstratblues. Dressed in a black suit that accentuates his skinny frame, Trivedi nods approvingly from behind his keyboard. 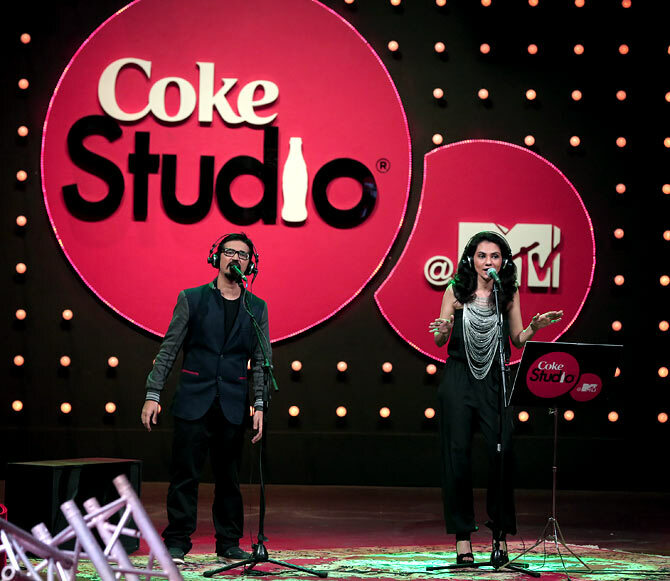 Image: Amit Trivedi records for Coke Studio@MTV. She sang Jai Ho!, but no one seems to know her! Bathed in red light, the set that looks rather magnificent on television is overshadowed by thick wires, camera equipment, crew members and hangers-on. Tanvi Shah, who is singing the next song with Trivedi, walks into the room to fetch something from her bag. Dressed in a black off-shoulder jumpsuit, a multi-strand neckpiece and high heels, she scans a few faces in the room for a hint of recognition and quickly makes an exit. A frequent collaborator of A R Rahman -- she won the Grammy along with the composer and lyricist Gulzar for the Slumdog Millionaire song Jai Ho!, Tanvi is amused that most people on the set haven't heard of her. "All of them have heard the song, but don't know that I did the playback for it," she tells me later over the phone. The song is wrapped up after three takes and Trivedi is escorted to the cafeteria for the brief media interaction. There are at least three self-asserted 'biggest fans of his work' at the table. Fresh off the success of his lilting background score for Vikramaditya Motwane's Lootera, Amit Trivedi is flooded with questions. What did he have to say about the allegations of plagiarism? Lootera's trailer theme song sounded alarmingly similar to the one featured in Anne Hathaway's 2011 starrer One Day? What is Trivedi working on next? "People will believe whatever they want to," the composer says, reacting to the charges of plagiarism, "but I hadn't heard the song before it was brought to our attention." "It's only when the teaser got out that we got to know that there was a song that sounded similar to ours." "I don't deny that they sound similar because I believe that two people can think alike." "What happened was pure coincidence. I was accused of being a thief. Why would I compose an entire soundtrack and lift a tune just for the theme?" he asks. Asked if the pressure to deliver with each project ever gets to him, Trivedi considers the question for a moment and says, "It does after a point in the sense that there is so much work, I hardly have any time to rest. Even today I am fatigued, running a temperature for all you know." Image: Sonakshi Sinha and Ranveer Singh in Lootera, which had a lilting background score composed by Amit Trivedi. Among all the talented people he has worked with so far, lyricist Amitabh Bhattacharya remains the closest and most cherished for Amit Trivedi. "You two are known as the Tendulkar and Sehwag of Bollywood music," one journalist exclaims. "Yes, we are!" the composer says, "We go back a long way. We have been friends since 2001." Does Trivedi think Bhattacharya and he are "changing the landscape of Bollywood music?" "Yeah they are!" gushes a fan before Trivedi reacts. "Maybe it's the need of the hour and these things are happening through us. I am just doing what comes naturally to me. I am not changing the scene or anything. Never in my wildest dreams have I thought about that." Back in the studio, the stage is being set for the next song. Titled Sheher Mein, the song is penned by Swanand Kirkire and will be sung by Trivedi and Tanvi. Slightly morose in tone, the ditty sings of the overwhelming experience that is city life, of how we live on despite the many hurdles it throws up in our faces on a daily basis and how we put up a facade to mask the turmoil within us. Trivedi appears more comfortable on the set, standing behind a mike as he lowers his eyes, patiently waiting for his part in the song to begin. 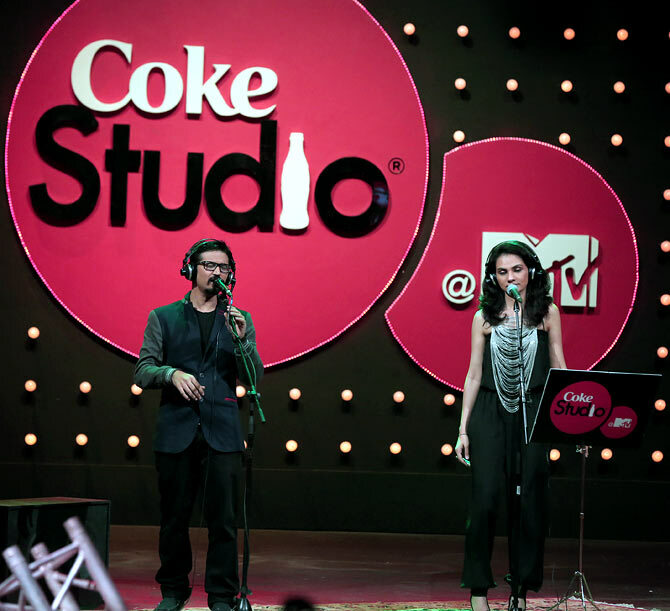 Image: Amit Trivedi and Tanvi Shah sing Sheher Mein for Coke Studio @MTV. Filmi Family Tree: Know Karan Johar's famous cousin?